What is the impact of information and communication technologies (ICTs) on the human condition? In order to address this question, in 2012 the European Commission organized a research project entitled The Onlife Initiative: concept reengineering for rethinking societal concerns in the digital transition . This volume collects the work of the Onlife Initiative. It explores how the development and widespread use of ICTs have a radical impact on the human condition. ICTs are not mere tools but rather social forces that are increasingly affecting our self-conception (who we are), our mutual interactions (how we socialise); our conception of reality (our metaphysics); and our interactions with reality (our agency). In each case, ICTs have a huge ethical, legal, and political significance, yet one with which we have begun to come to terms only recently. The impact exercised by ICTs is due to at least four major transformations: the blurring of the distinction between reality and virtuality; the blurring of the distinction between human, machine and nature; the reversal from information scarcity to information abundance; and the shift from the primacy of stand-alone things, properties, and binary relations, to the primacy of interactions, processes and networks. Such transformations are testing the foundations of our conceptual frameworks. Our current conceptual toolbox is no longer fitted to address new ICT-related challenges. This is not only a problem in itself. It is also a risk, because the lack of a clear understanding of our present time may easily lead to negative projections about the future. The goal of The Manifesto , and of the whole book that contextualises, is therefore that of contributing to the update of our philosophy. It is a constructive goal. The book is meant to be a positive contribution to rethinking the philosophy on which policies are built in a hyperconnected world, so that we may have a better chance of understanding our ICT-related problems and solving them satisfactorily. The Manifesto launches an open debate on the impacts of ICTs on public spaces, politics and societal expectations toward policymaking in the Digital Agenda for Europe's remit. More broadly, it helps start a reflection on the way in which a hyperconnected world calls for rethinking the referential frameworks on which policies are built. Luciano Floridi is Professor of Philosophy and Ethics of Information at the University of Oxford, Oxford Internet Institute, and Fellow of St Cross College, Oxford. His research areas are the philosophy of information, information/computer ethics, philosophy of technology, epistemology, and philosophy of logic. For his work Floridi has received various recognitions including the APA's Barwise Prize, the IACAP's Covey Award, and the INSEIT's Weizenbaum Award. He is the first philosopher to have been awarded the Gauss Professorship by the Göttingen Academy of Sciences. He is an AISB and BCS Fellow, and a Member of the Académie Internationale de Philosophie des Sciences. He was Chairman of EU Commission's 'Onlife' research group and UNESCO Chair in Information and Computer Ethics at the University of Hertfordshire. 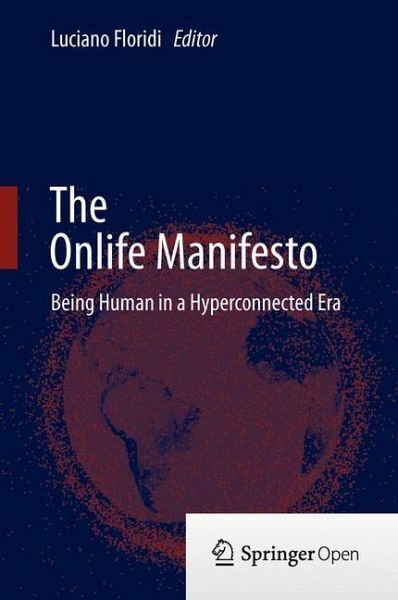 Introduction; Luciano Floridi.- Preface.- The Onlife Manifesto.- Commentary by Ess; Charles Ess.- Commentary by Floridi; Luciano Floridi.- Commentary by Ganascia; Jean-Gabriel Ganascia.- Commentary by Hildebrandt; Mireille Hildebrandt.- Commentary by Laouris; Yiannis Laouris.- Commentary by Pagallo; Ugo Pagallo.- Commentary by Simon; Judith Simon.- Commentary by Thorseth; May Thorseth.- The Onlife Initiative.- Background Document: Rethinking public spaces in the digital transition.- Part I. Hyperconnectivity.- Hyperhistory and the Philosophy of Information Policies; Luciano Floridi.- Views and Examples on Hyper-connectivity; Jean-Gabriel Ganascia.- Part II. Identity, selfhood and attention.- The Onlife Manifesto Philosophical Backgrounds Media Usages and the Futures of Democracy and Equality; Charles Ess.- Towards a Grey Ecology; Stefana Broadbent and Claire Lobet-Maris.- Reengineering and Reinventing both Democracy and the Concept of Life in the Digital Era; Yiannis Laouris.- Part III. Complexity, responsibility and governance.- Distributed Epistemic Responsibility in a Hyperconnected Era; Judith Simon.- Good Onlife Governance: On Law, Spontaneous Orders, and Design; Ugo Pagallo.- Part IV. The public sphere in a computational era.- The Public(s) Onlife - A Call for Legal Protection by Design; Mireille Hildebrandt.- Rethinking the Human Condition in a Hyperconnected Era: Why Freedom is not about Sovereignty but about Beginnings; Nicole Dewandre.- Designing the public sphere: information technologies and the politics of mediation; Peter-Paul Verbeek.- Towards an Online Bill of Rights; Sarah Oates.- On Tolerance and Fictitious Publics; May Thorseth.- The Onlife Initiative - Conclusion.